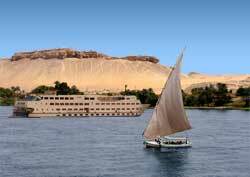 A Nile River Cruise takes you up close through 5,000 years of ancient Egyptian history. And, as your boat smoothly glides by the palm-tree dotted river banks, you view timeless farming scenes and drifting sand dunes. Each of these Nile cruise sites in this alphabetical list has won a Hillman Wonders Gold Medal. Click their blue names to view my web pages on them. Four great statues of Rameses II guard his temple's entrance. You fly from Aswan city to Abu Simbel (45 minutes). Or, you can take a bus (several hours). It is by far the largest of its kind in the world. The Great Hypostyle Hall of Karnak is particularly impressive. It is situated in Luxor city. The carved underground tombs of 60 pharaohs are in the Valley of the Kings, including that of Tutankhamun (King Tut). It is near Luxor. Best preserved and second largest temple in Egypt. Only Karnak is larger. A Ptolomaic-era sanctuary surrounded by a modern era city. She was Egypt's greatest female pharaoh. A double temple. One half is dedicated to Horus, the other half to Sobek. Other Nile cruise highlights include Valley of the Queens, Philae Temple, and Aswan High Dam.